Well, here we are at book 22 in this series, and I'm still in love with Inspector Montalbano and have no intention of ever falling out of love with him. I'm looking at the Camilleri page at Stop You're Killing Me and there seem to be only two more novels coming our way. Oh, what a sad day turning the last page of the last book will be, but I'll enjoy them while I can. I actually read this book back in October so I had to give it a quick reread before posting. 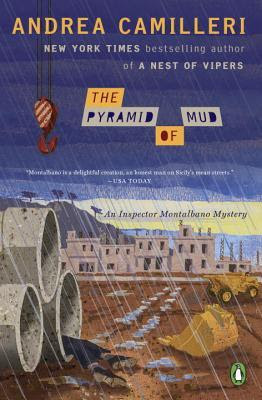 Montalbano's seen plenty of corpses in his career, but this particular dead man found in a tunnel at a construction site doesn't sit well with the inspector. The barefoot man was wearing only a pair of underpants and an undershirt, and had been shot in the back. Evidently, he had gone outside like this earlier that morning, and to top matters, he had come to the construction area on a bicycle. But here's the thing: how could he have ridden the bike uphill, mortally wounded, in the middle of a storm where it was "raining like there was no tomorrow?" The inspector begins with the assumption that the man was fleeing from someone, but who? And what did it mean that he went into the tunnel? Was there some kind of message there? He quickly gets an ID on the dead man and makes his way to the house, where another surprise awaits which launches Montalbano headlong into an investigation that, as the back-cover blurb says, takes him into a world "just as slimy and impenetrable as mud." "...the mud had entered the blood, become an integral part of it. The mud of corruption, of payoffs, of phony reimbursements, of tax evasion, cams, faked balance sheets, secret slush funds, tax havens, bunga bunga... it was all a symbol of the situation in which the whole country found itself at that moment." "as though the real Montalbano had gone away and delegated matters to a rough copy of himself, a stand-in devoid of hunches and ideas, unable to make connections and draw conclusions, lacking energy, passion, vitality ..."
proceeding through the investigation "with the same enthusiasm with which he normally signed memos in his office." It all relates to Livia, who is having a very difficult time coping with life after events from a previous book. It's not our usual Salvo here, and as a long-time fangirl of this character, it's really quite difficult to be caught up in his pain. Gah -- even now I'm starting to choke up just thinking about it. LOL -- I don't usually get this involved with characters who live in crime novels, but these people are like friends whose lives entered mine some years ago and have never left. Quite frankly, as I've said before, the people in these books are what keeps me buying and reading them, well, that plus Camilleri's savvy examination of the ongoing problems faced by his country, as well as the humor in pretty much every story and okay, the ideas I get from the food. As I say each time, do NOT start late in the series. 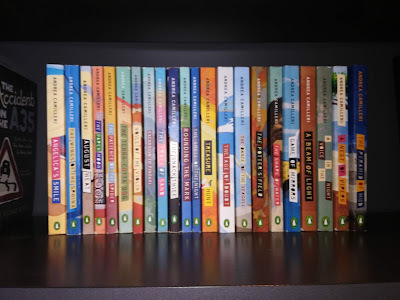 Not only am I pretty much OCD when it comes to reading series novels in order, but with these books, readers who start at random will miss what came before, and each book builds on the others. I love Inspector Montalbano and the people who surround him, and I seriously doubt that there's ever been a mystery series that has given me as much joy as this one. And yes, book #23 was pre-ordered long ago. Seriously, I am so behind in reading and posting that it's just beyond frustrating. 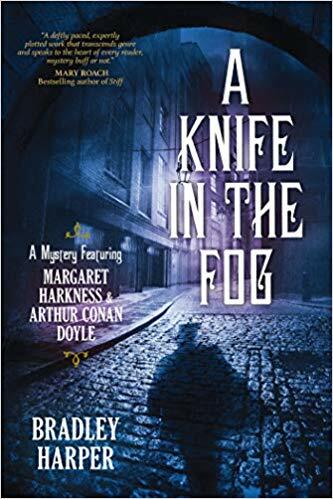 I calculate that it's about a 4-week lag, so this week I'm hoping to make up for some lost time, starting with this book, A Knife in the Fog, which as you can see by the cover, is "a mystery featuring Margaret Harkness & Arthur Conan Doyle." What this image doesn't show is that there's another guest star to add the cast, and that's none other than Doyle's own mentor, Dr. Joseph Bell. The true star of this show though is the one, the only, Jack the Ripper. In September of 1888, Doyle is surprised to receive a letter from former prime minister William Gladstone, asking him to travel to London for a task he will only explain to him in person, offering him a substantial amount of money to do so, no strings attached. On Doyle's arrival, he is met at Gladstone's club by a Mr. Jonathan Wilkins, Gladstone's personal secretary who explains that it's about "the Whitechapel homicides." It seems that Gladstone, who had "always been charitable to the community of fallen women in Whitechapel, had been asked by a "delegation of these ladies" to help end "this reign of terror." Surely Mr. Doyle, whose "scientific methods of analysis to to deduce the murderer" took shape in his Sherlock Holmes, would be willing to examine the work of the police, in order to "propose avenues of investigation they have overlooked." Even with a substantial amount of money as payment, and the opportunity to test his theories as to the importance of science in police work, Doyle is hesitant, referring Wilkins instead to Dr. Joseph Bell. Wilkins sweetens the offer and counters with the suggestion that the two work together. Doyle, thinking Bell won't go for it, sends a telegram and to his surprise, Bell telegraphs back that he is "intrigued," and that he would come to London the following Monday. In the meantime, Wilkins gives Doyle the address of the woman who will be his guide through the Whitechapel area, writer Margaret Harkness. When Bell arrives, the pace picks up as the three not only become involved with the police side of things, but eventually find themselves in danger as well. 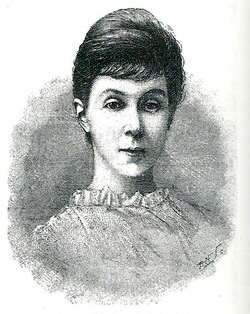 While in general I like my fictional characters to remain completely fictional (unless it's historical fiction based around certain true events, as in the novel I recently finished speculating on the fate of the 1845 Franklin expedition), I quite enjoyed the addition of Margaret Harkness to this story. In real life, as she is portrayed in the book, she was a journalist, a writer (albeit under a male pseudonym), and a political activist. 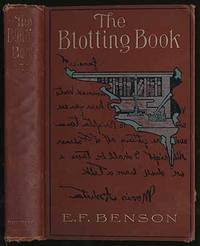 The author introduces us to her in men's clothing, armed with a Derringer which she knows how to use. She is also portrayed as a very strong woman with no obvious vulnerabilities except in the cases of other women she cares about, and she refuses to put up with general male BS that gets thrown her way. Putting her in the story gave a nice lift to the usual scenario of a fictional Arthur Conan Doyle as detective (which, let's be honest here, has been done just too many times), or as in David Pirie's series of books that featured Conan Doyle and Bell together weaving their logical magic and solving crimes. Despite its focus on the Ripper murders, A Knife in the Fog, which is the author's first novel, is not too dark of a read, so it's probably suitable for people who are looking for something beyond the cozy zone but not too close to edge of the darker spectrum. It's suspenseful and twisty, and overall, it's fun and a great way to spend a few hours in total relax mode. Along with the addition of Harkness I found the mystery engaging once it reached the point where Doyle & Bell found themselves in some jeopardy. The author also gets really quite clever at times, none more so than towards the end where he pulls off an amazing sleight of hand I wasn't quite expecting. I was also quite impressed with the author's knowledge of the slums of Whitechapel of the time. At the same time (and it's probably a me thing), I'm not a huge fan of the many deductive-reasoning scenes going on between Doyle and Bell where they are bedazzling each other with their Holmes-like conclusions about people or events -- in this case, less would be have been more. And with apologies to Mary Roach, who back-blurbed this novel saying that it had an "utterly unexpected reveal," I guessed the who (but not the why) long before that time. I also think there are a number of scenes that could have been left out which would have made this a much more tight narrative (involving Margaret's roommate) with absolutely no detriment to the story. However, let me say that I read a LOT of first attempts at novels and I knew that this one was different from the moment I opened it. The man can write and write well, something I genuinely appreciate these days when, thanks to e-publishing, everyone can be an author, including some people who really shouldn't. Truth be told, I much prefer a book where the writing is good with a few niggling mistakes than one with an okay plot and bad writing. Despite my own little "me things" and nags about this novel about some rookie errors made here and there, it was absolutely refreshing and even pleasurable to read this book. 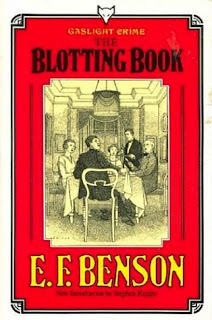 It generally takes me a couple of weeks to recover from October's dark-read fest, but I'm back again, with a novel from 1908, The Blotting Book by E.F. Benson. I had planned to read this book quite some time ago but, as often happens here at casa mia, it arrived, I shelved it, and promptly lost it. I found it again mid-October while going through my horror/supernatural books (which live in a different room from British crime) and had to laugh at myself -- I'm a huge fan of the author's ghost stories, so evidently my mind said "E.F. Benson. 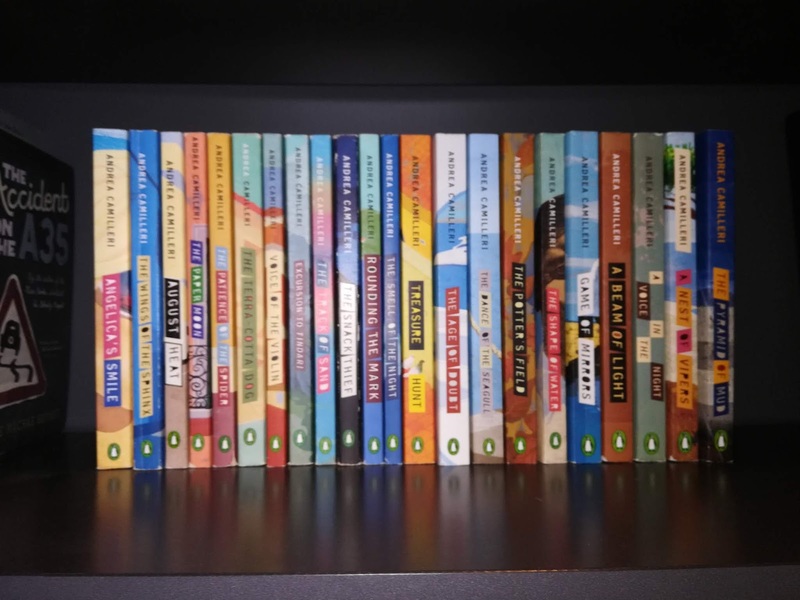 Upstairs" and I shelved it next to the other books I have written by him. I would guess that most readers of British fiction are familiar with E.F. Benson as the author of Mapp and Lucia; anyone who is a serious reader of ghost stories would also know the name. The fact that he wrote a mystery novel or two was news to me; I had no absolutely no idea until I read Martin Edwards' The Story of Classic Crime in 100 Books. There he was, with The Blotting Book sitting between Horniman's Israel Rank and Chesterton's The Innocence of Father Brown. [As a completely unrelated sidebar, I'll be following Edwards' book as a guide for mystery/crime reading all of next year, title by title; I've read quite a few of these so it probably won't be all 100.] This edition is part of Hogarth's Gaslight Crime series; I have quite of few of these little gems sitting in my British reading room, including another one by this author called The Luck of the Vails. It's also available online at Project Gutenberg, and there are a few versions available for Kindle. Benson opens this story at a house in Sussex Square, Brighton, the home of a Mrs. Assheton. She had lived there all alone until her son Morris came home from Cambridge. It is a well-ordered, upper-class home in which everything is done to perfection. For guests, it stands as "an example of perfect comfort," run precisely as it was before her husband's death some twenty years earlier. Twenty-one year old Morris is Mrs. Assheton's only heir, and by the terms of his father's will, Morris will gain his majority and thereby come into "complete control and possession" of his fortune if he waits until he is twenty-two to marry with Mrs. Assheton's consent; failing that, he will regain minor status until he is twenty-five. The thirty-thousand pounds that his father had left him is under the trusteeship of the family attorneys Taynton and Mills, who, as Mr. Taynton assures Morris one evening at a small gathering, have carefully invested on his behalf, so that ten thousand more pounds have been added to his portion of the inheritance. Since the money would fall under Morris' control should Morris marry, Taynton invites Morris to take a look at the books pertaining to his account in their "stewardship," an offer that Morris declines. As to the question of marriage, Morris most definitely has someone in mind, the other guest at the house that evening, a Miss Madge Templeton. What Morris doesn't know, though, is that someone has gone to Madge's father and filled his head with some pretty ugly things to the point where Madge has suddenly been forbidden to see Morris in their usual way. For reasons I won't reveal, Morris probably should have taken an interest in his accounts; he should have also listened to Taynton when he said that "we lawyers and solicitors are always supposed to be sharks..." since what is revealed that very same night at a meeting of the two attorneys reveals some very sharklike behavior, and also acts as a catalyst for everything that's going to follow, none the least of which is murder. "in manner, slow, stout, and bored, and looked in every way utterly unfitted to find clues to the least mysterious occurrences, unearth crime or run down the criminal"
and "an incompetent agent of justice." While it may not be the most exciting mystery of its day, I stayed engrossed throughout wondering how things would turn out, largely due to Benson's writing because he delves into the inner workings of the main characters, especially that of the criminal. In this sense, Benson's done a top-notch job despite the fact that the mystery is just too easy to figure out, especially for seasoned crime readers. I can see that many modern readers could easily grow bored with this book, but anyone into vintage crime and mysteries really at least ought to give it a try. And now that I've moved it downstairs where it belongs, it is a very welcome addition to my library of British mystery fiction.